In part 1 of my birth story (Click here to read), I left off right as the nurse midwife broke my water. The actual breaking of the water was quick and fairly pain free, but almost immediately afterwards, the contractions became very painful. When she broke my water, I was about 3-4 centimeters dilated, but within about an hour, I was in full-blown labor. The contractions were less than one minute apart, and I couldn’t think about anything else but breathing through them. Mr. Handsome was a strong rock through it all. He encouraged me through every contraction and reminded me to breathe. I tried to stay calm, but it sure wasn’t easy. Because I was hooked up to an IV pumping pitocin into my body, I spent most of the time just standing by the hospital bed. I was so overwhelmed by the pain that I couldn’t even begin to think about trying other positions. My goal was to do a natural birth without any pain medications. In general, I try to avoid drugs whenever possible, and I didn’t want to take on the risks associated with an epidural. After a few hours of intense contractions, I was sure it wouldn’t be long before the baby arrived. Unfortunately, both the nurse and the nurse midwife told me it would likely be another several hours. At that point, I hadn’t eaten in almost 24 hours and was completely exhausted. The midwife suggested that I consider an epidural so I could catch some sleep and my body could relax and dilate while I rested. It was honestly very difficult to make such a big decision while I was in so much pain, but I ended up accepting the epidural. Within 20 minutes, the nurse anesthetist had arrived and I had signed the paperwork. The insertion of the epidural was painful and created an odd sensation, but within minutes, my body was relaxed, and I was able to lie down. We slept on and off from about 2am to 7am. I had the discomfort of the IV in my arm (which made my hand go numb) and the epidural in my back (which I tried not to think about), and Mr. Handsome had the discomfort of the oh-so-wonderful hospital couch. Thankfully, I had packed an extra pillow and fleece blanket for each of us, so we had some of the comforts of home. I was surprised by how much the epidural allowed my body to relax. I could still feel my legs a little bit, but I couldn’t walk, and I couldn’t feel any pain. The nurse came in frequently to check on us and help me change positions so I didn’t become sore. A couple times during the night, I called over to Mr. Handsome and asked him to bring me water or jello, but for the most part, I was pretty comfortable. By 7am, I was dilated to 9.5 centimeters, and the midwife and a medical assistant started preparing the room for delivery. I tried not to look as they set out all the instruments and needles. I knew the baby was going to be large, and I knew there would likely be a lot of tearing, but I preferred not to think about it. At 8am, we woke Mr. Handsome up, and the midwife and nurse explained how to push. I’ve never commented, but I wanted to say that you deserve to be so proud of how you brought your baby into this world! The tension that such exquisite pain creates can be counterproductive to labor, and I want to commend you for having the bravery and grace to change. And to share your brave story here. You’re a superhero. Accepting help from medicine was a beautiful act. May we mamas – and everyone – support each other in the beautiful battlefield of delivering life, and all its nuance. Ditto to what she said!!! Thank you! You both are very kind. I am glad to have you as blog readers. A close family member of mine refused the epidural for her first, and it ended up being a super traumatic and dangerous birth, I’m glad to hear you used it when you needed it. I love this comment and agree!! Congrats on your little miracle! Very well expressed. I agree completely. Yes, you are amazing, Ellie. I’m sure you agree your little guy was worth it, though. Congratulations to you and Mr Handsome on your new status as parents. Congratulations to Mini Mr Handsome on his arrival. He’s going to have a wonderful life with you two as parents. Ellie, you are a trooper. Glad you got the epidural. Can’t wait for Part 3. You are perfecting the teaser / cliffhanger story very well! LOL! So glad you chose to have the epidural. I birthed from 1981 until 2005. All natural, epidural, c-section, 6lb babies, 10 lb baby, induction etc. and I will never understand why anyone would forego an epidural. The stress on the mother caused by such pain for such an extended period of time is way worse for the baby than the pain meds. I’m glad that even midwives have finally come around to realizing this. There is no gain in labor pain! J, there are some risks associated with getting an epidural, but yes, sometimes they are absolutely needed. Some women’s bodys won’t relax enough to safely deliver. Everyone needs to do what is best for them and their baby, but that goes both ways. If someone wants to have a natural birth and are able to, there shouldn’t be any judgement from anyone there either. I agree. There is nothing wrong with having natural births. Every woman has to do what’s best for them and their baby. I’ve had two epidurals and three natural labors. I was amazed at how fast after labor I was able to get up and walk around and also not be hooked up to fluid or anything. So for me recovery time was faster. Labor was painful but worth it. There should not be shame in having a natural labor or getting an epidural. Women should support each other and encourage each other, instead of judging others for doing something different than they did. I’ve never seen judgement for natural birth, only from the opposing side always! I’m so glad you’re writing this all down while it’s still fresh in your memory. I wrote my daughter’s birth story down soon after she was born, too, and when I looked at it a few years later, was shocked by how many details I had forgotten. I’m glad you were able to get pain medication when you felt that you needed it. That’s exactly why it exists, and until you actually know what you are dealing with in terms of pain, it’s hard to know in advance what you’ll need. Plans change, and flexibility is an important part of parenting. Sometimes that part starts with childbirth. The part of childbirth that I found the most profound was the feeling of connection to every mother that’s ever been and ever will be. Like a part of an infinite continuum. Pushing out a baby is such an incredibly, primally, human experience. I am so very happy for you and your family. Oh goodness., I can sympathize with you. All my contractions were like that where I could barely breathe or a catch a breath between contractions. My 1st epidural worked for a few hours but stopped for the last hour of labor. It was brutal. The good news is if you have more kids it should be easier for you with each one and you’ll recover quicker! Can’t wait to hear the rest. I am glad that you were able to get some rest. Don’t worry about the fact that you accepted the epidural! They are wonderful when they work! The pain a lot of times causes your blood pressure to go up. My doctors advised me to take the epidural when I was in induced labor due to preeclampsia. Everyone feels a different amount of pain. My sister had three children and was just uncomfortable at the end each time. I was in horrible pain. We were walking while I was in labor with my third and having contractions when my sister asked me what they felt like. She honestly didn’t know, because her contractions didn’t hurt. Besides wanting to smack her (just kidding), it made me realize that not everyone experiences the same amount of pain. Since we all have different pain levels, we have to decide for ourselves if pain medicine is worth it or not. I think you made a good decision to allow yourself to relax and get some rest. Babies require a lot of energy. I have said since my firstborn was arrived, that other than accepting Jesus as Saviour, and choosing to marry my husband, having an epidural was the third-best decision of my life. Perfectly said! 😄 I agree completely! Ha! So true! I labored for 24 hours before getting an epidural, and I almost named my baby after the anesthesiologist. I would have if we hadn’t been set on a name already. epidural was painful upon insertion, I would have thought that they’d freeze the spot before inserting that. Also I think it was quite a thing for you to do the induction birth, I wonder if you were offered a c section? But your willingness to do this was good and turned out. This will be a positive choice for more births. I’m also waiting to get the rest of your story. I have had three children and I had to have a drip induction with my first (we call it syntocin but I think it’s the same thing). I also had to have an epidural because the contractions were brutal. It made me sad and I wondered if I was just being a wimp. However, my subsequent two births (which didn’t have a drip) were so much less painful. I didn’t need any drugs as arching my back was a great way to cope with pain! That wouldn’t have worked against the pain of the syntocin contractions but made “natural” contractions totally tolerable… You have done so well to have given your baby safe passage into the world. Congratulations. Those newborn days are unique but hard (with children- the days are long but the years are short!) Good luck! Wow, that’s similar to what happened with my first baby. I’m sorry you had to go through all that. I was so disappointed about the pain and the following epidural, which I had been so set against, that it kind of made me not as happy or as proud of myself at first as I should have been. But it’s still a huge accomplishment, and you went through a lot to get that little guy! You did great! I’m so sorry you felt that way. We can be so hard on ourselves for things we would never look askance at others for. You brought a child into the world, one of the most profoundly momentous experiences a woman can go through. I hope you’ve given yourself a break over this by now. You certainly deserve it, and you deserve to feel every drop of pride and excitement that comes with the experience, no matter what procedures or interventions were involved. Kay, I’m so sorry your birth plan didn’t go as expected. You did great and brought a life into the world. I hope the feelings of disappointment went away as quickly as possible and your subsequent births went well. I’m sorry you felt that way, too. I know that feeling well. I chose an epidural because it had been 30+ hours already, and I was drained completely. My natural birth plan went out the window even further when it was determined a C-section was necessary. Then another 2 C-sections for my other children. No matter how well meaning, natural birth has become a high place in the motherhood path. I hope all women work to tear that down every time we can and encourage a woman that she is amazing for bringing a life into this world no matter the methods of medical intervention. While natural might be the goal to strive for, a woman should never feel put down or less of a woman for any reason. This is on the verge of TMI….tearing, stitches, etc….. This is in no way TMI, that’s birth. Giving birth is not some dirty thing you have to be hush hush about. You obviously aren’t involved in a good birthing community. Um, it’s a birth story, curious why you are even here reading it if you think there are to many details. I appreciate that Ellie is keeping it real. In my opinion, reproduction within the context of marriage is normal and natural, and there’s nothing here my three year old daughter doesn’t know about. Choosing to not white wash the labor process helps build empathy and respect for moms’ strength and determination. The important thing is that you and the baby are healthy. Plans do change and it’s just life. Every labor is different, one may be hard the next easy and then the next few hard. Some think that the more you have the easier time you have and that’s not really the case for me. The 3rd was the easiest and the 5th was the hardest. I’ve had three natural labors and with my 5th it was so much pain that at 8cm or so I had to get medicine in an IV. I felt like a failure because the medicine didn’t even help and he was born 30 minutes later. With out 6th, I’m still hoping for a natural birth but I do realize that the important thing is doing what’s best for the both of us. Years later I’m not sure it really matters how the child was brought into the world just that they were. You did an awesome job delivering a child, and don’t ever feel less than amazing just because it didn’t go as planned. Very similar to my experience too! Except my baby was a tiny girl. I had gestational diabetes so they induced me 2 weeks early. Which wasn’t necessary but anyways. I was so gonna do it myself without pain meds, but after they broke my water it got so intense and so long I couldn’t cope anymore and said give it to me! She was born after 24 hrs of labor. But my next 3 babies were much easier and shorter labors with no epidural, even with 2 more inductions, so don’t stop with just one baby 😉 can’t wait to hear more, we mom’s all love to hear each other’s birth stories! The joy and emotions after birth is worth it all…. Ellie, you should be proud of yourself for choosing to have the epidural when it became apparent that was the right choice for you and your baby. I too, didn’t want to have an epidural, but my midwife encouraged me to get one and I went from 7cm to baby born in less than 3 hours, after 30 hours of previous very painful labor. The epidural saved me from having a c-section due to failure to progress. I went in not wanting to get the epidural, but I ended up getting one myself. With every contraction I had I was throwing up, not how I wanted to to be giving birth. My nurses said that getting the epidural would help with that and so I said okay. I’m hoping with this birth since my morning sickness hasn’t been as bad like with my 1st I can hold off on getting the epidural for a while and walk around some. I actually did cry about getting it but my husband talked me down about it saying that I did the right thing and our baby will be get here no matter what. He was a great support during labor. It’s been two and half years since I had my 1st and I haven’t had any problems from the epidural. Enjoy your little man they grow up fast. We just built our son his twin size Batman bed, we got him for becoming a big brother, plus we need to convert his toddler bed back into a crib for the new baby coming in May. It seems like it was just yesterday I was bringing him home from the hospital and he was sleeping in a bassinet. I now all labor has various degrees of pain, but mine was unreal. The cord was around my baby’s neck. I truly believe if I had continued on with that terrible labor that I might not have a daughter. You made the right choice. It was hard going in knowing you want one thing but end up going the other way. I couldn’t see throwing up every contractions and then when it comes time to push that would have been to much trying to push and throw up at the same time. I was able to relax and get energy to push, I enjoyed my birth experience. Cause in the end game I got the best reward my son. I used to watch the TV show “ER”, and there was a scene once where a character got an epidural and talked about wanting to kiss the epidural guy. I laughed at the time, until I got one! I had been having camelback contractions (so hardly any rest) and just sitting still to get the epidural was hard through that. But it was so worth it. I pushed for three hours the first time around and needed every bit of that relief because the pressure was horrible. By the second time around I had heard that it’s easier to push in a more natural way without an epidural, since you can feel more, but despite my water breaking naturally, I needed pitocin to start labor (again) and my contractions were too much. I’m pretty sure I would have passed out from the pain if I didn’t have an epidural both times. At least the second one was a bit shorter! Sometimes I wish I would have been able to do it without an epidural, but some bodies (and labors) just aren’t set up that way, I think! Either way, you did an amazing thing. Congrats! Reading your story is bringing back memories… and I have an upcoming delivery to look forward to. haha. I’ve never experienced the intensity of an induced labor, but remember how the pain increases with the breaking of the water. Thankfully, I’ve had fairly short “hard labor” times. Can hardly imagine what it would be like to try that for an entire night or more. Congrats on the arrival of your sweet boy. Glad it all you both made it safely through labor and delivery. Thank you for sharing your story! I think you have a really good blog. I enjoy the progression of stories over time. And I like that you are associating closely with the Duggars. The Duggars birth stories are all highlights after their marriages and this story of yours is definitely a highlight. I’m looking forward to reading further about your story. Thanks to you, Mr H. and baby H Jr.
Girl… epidurals help SO much! I am thankful for modern medicine where we can now make labor a little easier on ourselves. I wish more Duggar women would get on board. They make labor so much easier. If someone doesn’t want an epidural there is no reason for you to try to shove your option at them. An epidural would not have prevented what happened in any of their births. Jill and Joy would still have needed csections since their babies were breech and Jessa would still have had a placental abruption with Spurgeon. In Jinger’s case it was a very smart choice to get an epidural though, since her body wasn’t relaxing enough to be induced. Jill should have gotten her csection sooner with Israel, and Joy didn’t actually make any poor choices in her birth with Gideon, that was on their CPM for not catching that he was breach. I think the problem with the duggars is they use underqualified cpm midwives. I’m all for cnm midwives since i had one. If jill and joy had a proper midwife they would’ve caught the problems earlier. In Canada and many countries cpms aren’t allowed since they aren’t properly trained. It’s OK to share birth stories but when you get into how you thought you were going to tear, or you actually did tear and needed to be stitched up, that’s a bit too much to post online. If you wouldn’t dream of sharing a picture of something online, then it’s probably not appropriate to say, either. I can understand how people are squeamish about things, or how some things are personal. Thank you, I agree with you. Some things are just better left private, but a lot of people don’t understand that these days. I’m sorry you feel that way, but that’s how childbirth is. Lots of people are interested in it in general, and in Ellie’s experience specifically. You don’t have to read about it if it makes you uncomfortable. This is Ellie’s blog about her BIRTH STORY! Tearing is common in birth and isn’t something that has to be kept hush hush. If you’re squeamish you shouldn’t be reading a birth story. Ellie please don’t let comments like these prevent you from sharing the way you want to. You are keeping things real and authentic, people acting like what happens during birth needs to be kept a secret are the people who cause mothers to not be fully prepared for their postpartum experience. This reaction falls into the is it OK to feed the baby in public and after tell your other children the baby came under a cabbage plant or by the stork genre. If a woman has a growing belly, that gets bigger to huge by the ninth month…..then isn’t it logical to wonder if it did a little damage on it’s inevitable passage? Sometimes not talking about the evident things, as if they were not, because that is faux pas, taboo, can just lead to otherwise well meaning people going astray in plain sight. Its like having no traffic signs and thinking everyone will know what to do. Freeing up the information and respectfully breaking the code of silence is preferable in my opinion. I like the blog and the comments and found nothing ‘wrong’ with it. There’s a huge difference between talking to another woman in person, sharing your birth stories, and posting graphic details on the web for the entire world to read. Nothing wrong with sharing if it’s done in the right context. However, there are still some personal bodily things that do not need to be discussed with anyone but your doctor. Yes, giving birth is exciting. But will you be proud in a few years that you told everyone intimate details about tearing and stitching? Mentioning she didn’t want to focus on tearing isn’t inappropriate. It’s Ellie’s decision what she wants to share and a very personal one. Just because you wouldn’t doesn’t mean no one should. I wouldn’t post pictures of getting an epidural, but it is okay to talk about. Getting stitches or not is part of giving birth. It is nothing to be ashamed of or pretend didn’t happen. If you don’t feel comfortable hearing about it, don’t read that part of the story. Instead of telling someone else what they should or shouldn’t say, just monitor what you read yourself. Once again, if it bothers you, don’t read a BIRTH story. Nothing that Ellie said was “graphic”. You are being extremely dramatic. It’s nothing to be ashamed or embarrassed about. Well done to Ellie for getting through these challenges. I am due with my first baby in June, and I for one am so glad to hear and read such very real and honest stories. I am not good with expectation management, and I want to be fully aware of all the hard and scary things that can happen (and if I’m lucky, I’ll be pleasantly surprised that they don’t). My mother nearly died with her first baby because she didn’t know what was ‘normal’- because she’d only been told the whitewashed stories. So thank you, Ellie, for helping me and other mamas-to-be to be more prepared. If you are grossed out by details of labor and delivery, or think that it’s TMI, that shows a lack of maturity on your part and you shouldn’t be reading a birth story. 4:39 Even medical students faint sometimes when they see blood or an operation. It’s no indication of immaturity if you don’t want to see or hear “gross” details. We need to be more understanding of other people’s feelings when it comes to these things. 11:11, Do you think the med students who faint wake up and complain to the doctors and ask them to make surgery less “gross” to them? Nope, they get up and continue on with their lives. This is Ellie’s blog and complaining about what she posts shows a huge level of immaturity. If you don’t want to hear the details of someone’s birth DO NOT read a birth story. The people who are complaining should have stuck to reading Ellie’s first post about baby HandsomeJr, and skipped out on the detailed birth story. Looks like labor was very tough and draining. I’m sure it was all worth it though for your little boy! Previously you had stated you and Mr. Handsome want a big family. Is that still your desire after this pregnancy and delivery? It was very much worth it. 🙂 I have always said I would like at least 4 but that I want to space them out 2-2.5 years. I am still thinking that, but I now have a greater respect for any woman who gives birth, whether 1 or 20 times. For what it’s worth almost every mother I’ve ever talked to said their births following their first were wayyyy easier. I’m so happy that you were able to get the epidural quickly once you decided it was for the best. With my first, I knew I wanted one, but anesthesia took too long to arrive and I missed the opportunity. It was awful. For my second, they actually placed the epidural before starting the induction, so I never really felt anything until I had the urge to push. I agree with others saying not to be hard on yourself for things not going as planned. All that really matters is a healthy baby and healthy mom. Thanks for sharing, Ellie. Your story, and others’, are very helpful to 1st time moms who have no idea about what labor and delivery will be like. Out of 14 deliveries, I had 6 epis. They were for all the inductions. Your body is not made to handle manmade labour. It’s that simple! No one should criticize for having or not having pain meds! We should be glad we live in an age, where, because of medical advancements amd interventions, most mothers and babies do not die!!! Thanks for your honesty. Most stories these days promote a simplistic, tidied version of childbirth when it is often messy and complex in reality. Grateful to live at a time when we don’t have to go into the process hoping and praying to survive, but have the medical means to ensure the health of both Mama and Baby. How was your recovery from the epidural? My lower back was painful for a few weeks after. It’s wonderful you can tell us your birth story . What a story it is !!!!!!!! ……Women are better off knowing everything there is to know about childbirth. We are all different ,and women are sometimes surprised at each other’s experiences in birth . It’s comforting to know we all go through similar experiences , and we are able to share them .. Induction is always tough..especially when the body’s not ready …. 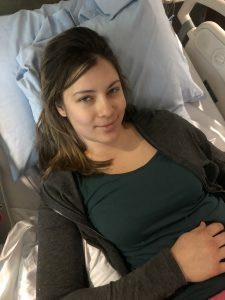 I see that many others have already encouraged you for your decision to get an epidural, but I still wanted to add my voice and say, “Good job!” I, too, wanted to have a natural birth. My husband & I took Bradley classes, where we learned about the risks associated with an epidural. But I had a long & difficult 33-hour labor, and at hour 25 we decided to get the epidural, not only to help the pain but to let us SLEEP. Best decision ever! (And none of the side effects happened to me or my baby.) My mantra is “healthy mama, healthy baby.” At the end of the day, that’s all that matters. Hope that Mr. HJ is settling in.